To be quite honest, I just think this is so pretty. And even more honest, it it soooo good! Simple? Well, yes! We were watching a food show a while back and Scott Conant an Italian restaurateur in New York and Miami was showing how he makes the most sweet, simple spaghetti. It is truly divine in its simplicity. I will say it over and over and over again… simple. I stress this because you may thinking, how can it be so good? It’s just pasta, olive oil, tomato and basil? Yes it is, but there is something more to it, I could swear this is what makes it. Butter. Butter. Say it with me, BUTTER! Not even that much butter, just a tad. And maybe I am too new at this to know better, but butter? In pasta? Wowoooweewow people, I can’t believe it is butter. No substitutes here please. Just try it, you will never look back, never think twice, you will just do. Now I must also admit, I have not put butter in any subsequent pasta dishes, so this may only work here. But when I do make another pasta, I will let you know. This is just plain good. I hope you enjoy it as I did, this little piece of simple heaven, you go Scott! 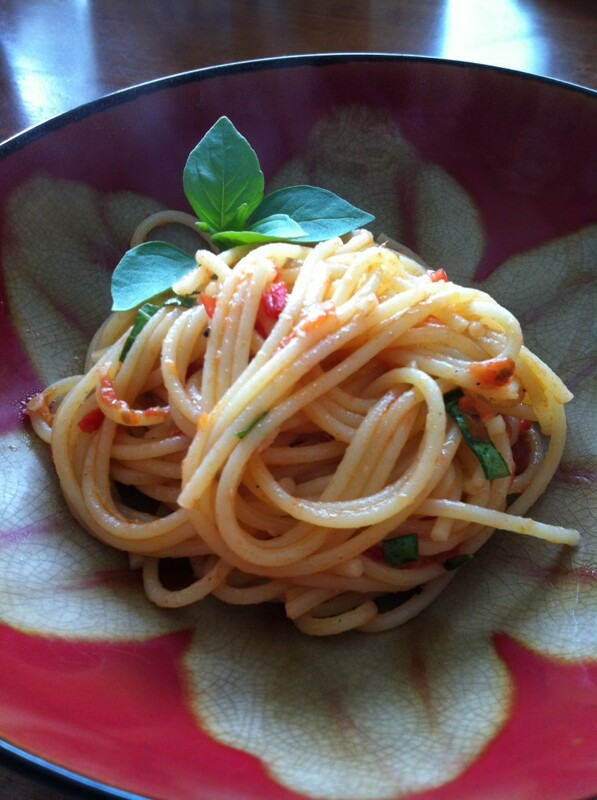 I used high quality dried pasta, he used fresh. Either way is ok, but try to stick with at least a good quality dried pasta. By the way… I watched this being made on t.v., and then recalled the recipe months later, so I would consider this adapted from Scott Conant’s brilliant famous pasta dish at Scarpetta. But the trick here, you will see, is to make each serving at the end when you go plate. Do not try to skip this step, it does not work as well. There is a good reason for this… butter. 1. Chop tomatoes. Chop a few tbsp of basil for end of recipe. Keep a few leaves for garnish, and freshness. 2. Heat up 4 tbsp of olive oil in medium sauce pot. Add salt. Place tomatoes in and let cook for several minutes. Grab your potato masher, and mash away, but leaving a few pieces here and there. Let it come to a bubbling boil, then reduce heat, simmer on low while preparing olive oil sauce. About 35 minutes, not much more. Now is a good time to boil your pasta water. Do not add your pasta to water yet. 3. Put the rest of the olive oil in a medium pot, add whole basil leaves, red pepper flakes, and garlic. Reduce amount of pepper flakes if you would like, I like 2 tbsp. Let it come to a boil, about 25 minutes, no more. Drop you pasta into boiling water. Cook to al dente. 4. Remove tomato sauce from heat. Strain olive oil, and add to tomato sauce. Take a large scoop of the tomato/olive oil sauce, add to saute pan. Add about 2 servings of pasta at a time into pan on top of tomato sauce. Add a little pasta water. Combine well. Now add fresh basil, and a little Parmesan cheese, then last but not least a small piece of butter, about 1 tbsp for two servings. Toss it in the pan, move around, tossing it about. Take your tongs, and serve swirled on a plate. Add a few basil leave for garnish and fresh taste. If there are more than two people, make it in batches just like the “how to”. You will not regret the extra bit of work. May take 5 extra minutes. You can certainly substitute the white pasta for wheat, or your favorite kind. For this, I like white. definitely going to try Yumm!